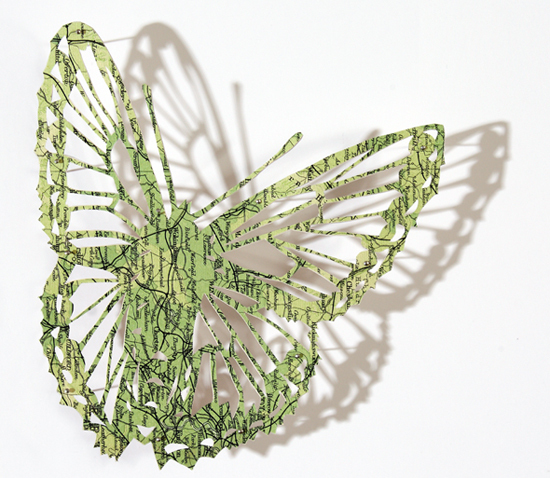 I am off to Manchester this week to install my work in Manchester Art Gallery as part of the First Cut Exhibition. The gallery commissioned me to make a piece of work to be installed in one of the Pre Raphaelite galleries. 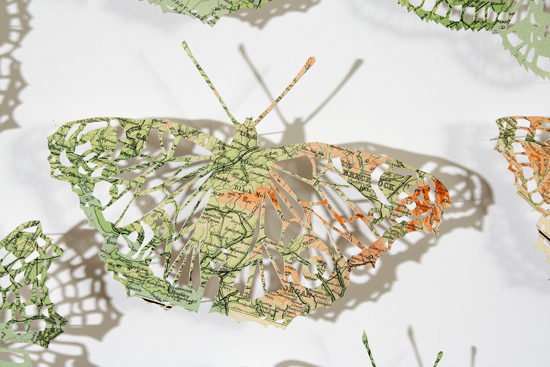 The piece I made is called An Apocalypse of Butterflies. I was inspired by an article I read about how the very wet summer we had here in the UK was apocalyptic for British butterflies. which struck a chord with me. I was also reading about when Manchester Art Gallery was first started, which was a time of great discoveries and collecting of flora and fauna and discovering new species. 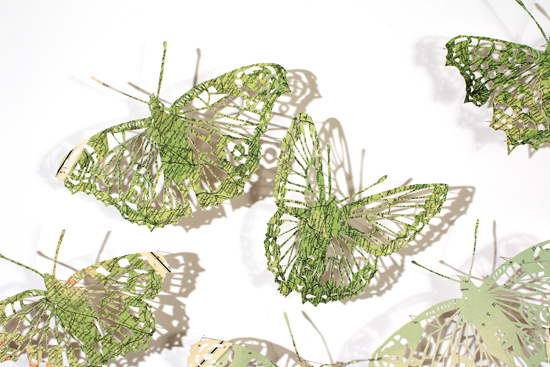 So this all came together in an installation of about 60 butterflies that will be pinned directly to the wall around some Millais Paintings (no pressure there!). 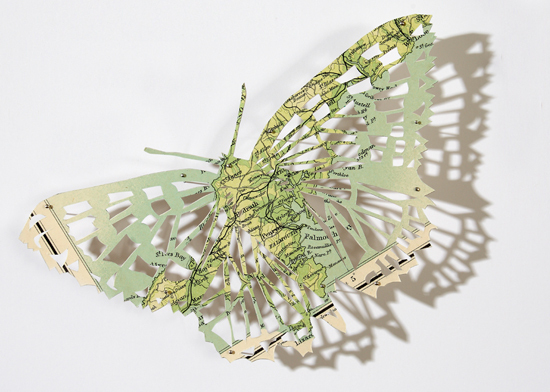 The butterflies are cut from Orographical Features maps of Great Britain and are all butterflies that are endangered or getting that way. This piece of work has taken a long time to complete, I've been working on it for what seems like months, but somehow it took a long time before I really understood it and could get the butterflies to look how I wanted them to look (or more of less). I will post some images of the installation once it's up but for now here are some details. I would love to hear what you think. Yeah, looks like the perfect place to show your work. Wish I could see it in person but hope you have some installation images to share here. Enjoy the opening! your work is amazing!! came here vis-a-vis Spirit Cloth, by Jude Hill. Hi thanks, good luck with your project. Hi Claire, I love your work and i loved seeing the exhibition last year when it came to Nottingham, and ever since then i have been looking at your work, trying out my own inspired copiies for my A Level work and i have been using information about you and your work for my essay which i have been working on. for my essay i have talked about many artists from The First Cut exhibition and how they have inspired me in my own work. Dont know if you would remember but i got in contact with you in september last year and i asked you a few questions about your work, I'd just like to say a massive thank you for your response as it has helped me to improve my grade in art as i have been able to get first hand information from yourself.